What is the difference between the world’s oldest democracy and the world’s largest? In the former, men take office and then become mass murderers; in the latter, men become mass murderers and then take office. Having persuaded a fifth of the Indian electorate to vote for him, thereby securing nearly a third—31% to be precise—of all votes cast, Narendra Damodardas Modi crushed all opposition to stride onto the national stage as the undisputed leader of the Indian polity; commanding nearly two-thirds of all seats in the 16th Lok Sabha. When the ‘first past the post’ undiluted Westminster model was imported by the framers of the constitution in the late-1940s, it was designed to deliver crushing majorities in the Lok Sabha for the Indian National Congress. Now that the Hindu State has finally come of age, are we in for a Thousand-Year Reich? Incredibly, analogies to the Third Reich are not just the preserve of Mr. Modi’s critics. 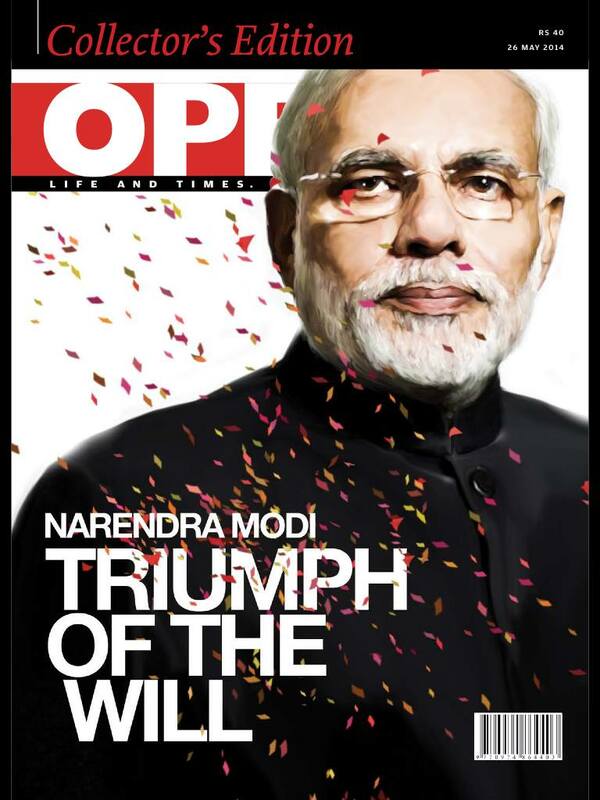 The cover of Open, a glossy Indian magazine targeting India’s burgeoning Neo-Middle Class (“among the best looking magazines in the world”), literally reads “Triumph of the Will.” Although it cannot be ruled out that the editors, being utterly illiterate and unfamiliar with the most famous propaganda film in history, had failed to see the reference. So, is it 1933 in India? I am still taking stock of the situation. Its pretty clear that Mr. Modi will try his mightiest to deliver on his promised reforms. The question is: what else does he have on his mind? And what happens if and when his economic gambit falters. As I’ve said before, I’m not so worried if Mr. Modi is successful in delivering high growth rates. On the other hand, if he fails and gets politically threatened, he will resort to ethno-religious mobilization to consolidate the pan-Hindu vote; perhaps even use his office to intimidate his rivals. Given the analogies with the 1971 election, a second experiment with dictatorship cannot be ruled out. Therefore, the policy tensor sincerely hopes that Mr. Modi succeeds in delivering on his promises of rapid growth and modernization. As to Mr. Modi’s Hindu nationalist agenda, we will soon find out. The BJP’s election manifesto promised “to explore all possibilities within the framework of the constitution to facilitate the construction of the Ram Temple in Ayodhya,” and draft a Uniform Civil Code. The former promises either an unprecedented amount of ethnic violence (i.e., massacres of Muslims), or a “peace of the graveyard” whereby India’s 180 million Muslims have been terrorized into silence; neither scenario being particularly appetizing. A Uniform Civil Code, in principle, would be a welcome development from a progressive point of view (Muslim personal law as it stands sharply discriminates against women). However, it too could conceivably morph into a demonstration of Hindu ascendancy, with Brahmins dictating the fine print to impose the supremacy of twice-born upper-caste Hindus. Neither issue is likely to be tackled soon. The markets expect Mr. Modi to get to work right away on fixing the economy without distractions. The most critical development to watch for in the next few days is the role allotted to Amit Shah in the incoming administration. The scariest scenario is Mr. Shah running India’s elaborate apparatus of internal repression—intelligence and security agencies—which would signal that Mr. Modi intends to put India on the fast track to becoming the world’s most brutal internal security state. Not that it is very far from the top in world rankings. What’s up Dear, are you truly visiting this website daily, if so afterward you will absolutely get fastidious knowledge.